Is Jürgen Habermas’ work wholly theoretical? No. First, he holds that the ability to see the worthiness of other people’s goals is a condition for participation in a discourse community. And second, the subject under discussion should determine what will count as convincing argument. He has expressed optimism that his notion of discourse is compatible with likely global peace among nation states. Habermas has struggled with the idea of self-determination as an individuating criterion for states, and tried to determine the kinds of negotiations necessary for mutual cooperation within Europe. He has also claimed that dialogues between religious thinkers and secularists can be mutually beneficial even though some of the core beliefs of each group cannot be fully translated into the worldviews of the other. 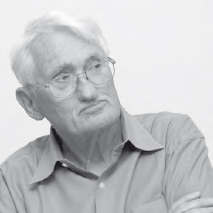 Generally speaking, Habermas’ views on rationality, cosmopolitanism, and democratically negotiated universal human goals represent a re-casting of modern ideals. Other post-modernists, such as Jean Baudrillard (1929–), Gilles Deleuze (1925–1995), and Pierre-Félix Guattari (1930–1992), regard such ideals with greater skepticism and suspicion. German philosopher and social theorist Jürgen Habermas is a postmodernist who has defended Enlightenment democratic values (AP).